Fortnite fans and data miners have found evidence that a respawn feature seemingly inspired by Apex Legends is coming to the game. This feature might be added soon. Before Season 8 launched, Epic confirmed that they were looking into adding better pinging and respawning. Both of these features are part of Apex Legends. Pinging was just added to Fortnite and it seems Epic’s other tease, respawning, is getting added into the game next. This is based on strange vans players have found in the game’s files. 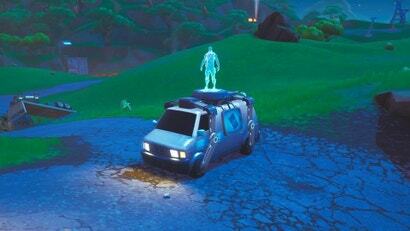 These vans have a holographic image of a person on top of them and in the files are called Second Chance Van. Twitter user FortTory found these vans, which aren’t currently accessible in the game. Other users also found evidence of new cards that could interact with the van. It is believed that the respawn system in Fortnite, if implemented, will work nearly the same way it works in Apex Legends. Players who die will drop a card which can then be taken to one of these Second Chance Vans, allowing players to bring that teammate back. While it seems very likely that this new respawn feature will be added soon, exactly how players will return is unknown. Will they drop in from the sky or just appear? We also don’t know if this will be a permanent feature or something that is part of a limited time event. Stealing good ideas is good. I wish more games had Apex's call out system. I'd love an O.G mode where it goes back to the original map, original weapons, but with the current level of stability and graphical fidelity. The kids would hate it, but that was the peak of the game for me.